It's September now, and in my head... that. means. fall. And fall equals comfy sweaters, warm yummy drinks and awesome weather. I'm pumped. And no, I don't care if it's 90 degrees outside. NOTHIN'S GONNA BREAK MY STRIDE. ...ha! I've written my very first sweater pattern, and I've called it "The Homebody Sweater". Let me tell ya, it's already gotten great use in my home. It's so so comfy. The drape and casual-ness of it is just, ugh... the best!! This sweater makes a great "beginner sweater" for someone who hasn't made apparel yet. Trust me when I say-- it is so EASY! Basically the whole sweater is made up of hdc! It's designed to fit "oversized", so you can feel extra comfy in it. -I wrote the pattern for sizes small through large. I will also provide additional notes for customizing the sweater to your specific preferences or size. 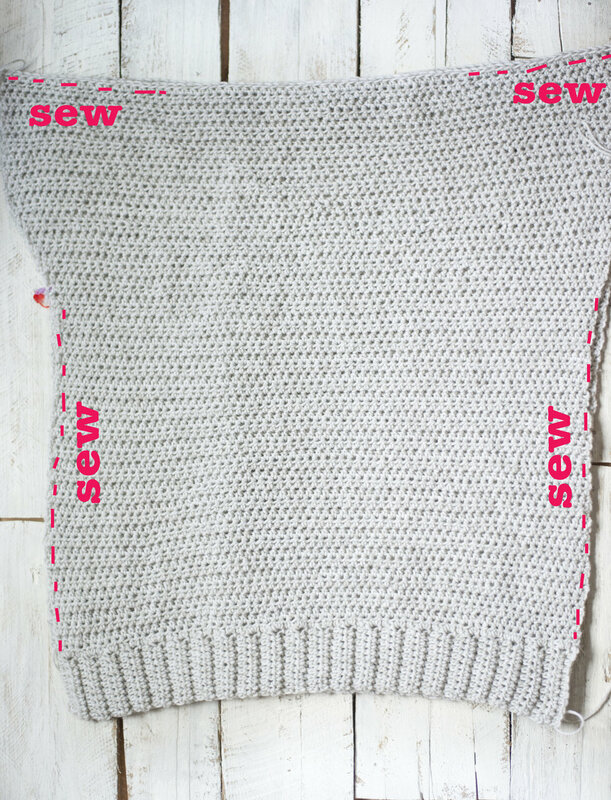 -If you wanted to customize the width of your sweater, you can add or take away about an inch to the width by adding or subtracting 2 rows on the bottom ribbing. This will obviously throw off stitch counts when you follow the pattern so be aware of that. 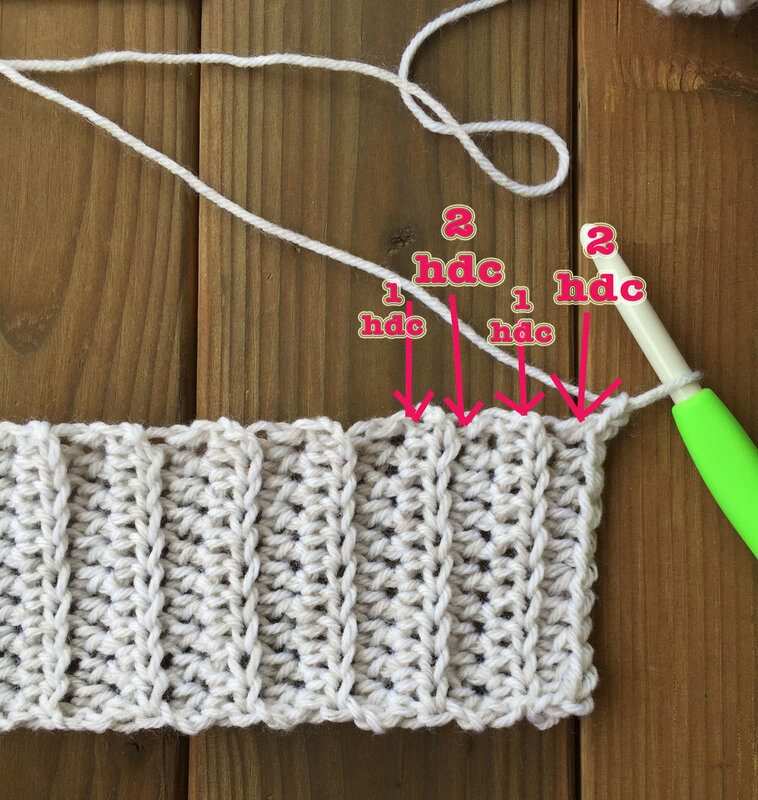 -If you wanted to add length to your sweater, you can simply add rows before you increase in row 35. -If you wanted to increase the width of your sleeve, you can sew up less rows on the sides when attaching the two pieces together- making a shorter seam. After you’ve made two body pieces, you will lay them both right sides together, and sew with yarn needle and yarn. You can pin them together with sewing pins for assistance. You will be sewing on the very edges of your pieces. For the top, sew the pieces together starting on the outside edge. I sewed along the top coming in 20 sts (I counted using the last row). this was about 7 inches in. You could customize how big of a neck opening you would like by taking away or adding to your sewing. Then sew the sides, starting on the bottom at row 1 of the body, above the ribbing (the ribbing is not included in the seam). For SMALL sew up through row 34. For MEDIUM sew up through row 33. For LARGE sew up through row 32. 2-30) ch 2, hdc around, join to first hdc (46) Finish off and weave in ends! You’ve got yourself a new comfy sweater! 2-30) ch 2, hdc around, join to first hdc (48) Finish off and weave in ends! You’ve got yourself a new comfy sweater! 2-30) ch 2, hdc around, join to first hdc (50) Finish off and weave in ends! You’ve got yourself a new comfy sweater! And that's it! I just know you're going to love this sweater. I hope you LOVE it! And if you have any questions whatsoever with it, feel free to ask in the comments below. If you complete your sweater... tag me over on Instagram. I would so love to see it! New Free Crochet Pattern for the Varsity Sweater! Welcome! I'm the Meg behind Megmade with Love. This is your place for comfy and cool crochet patterns. Anything from sweaters and accessories to home decor. All photos and patterns are copyright of Megmade with Love. Items made with my patterns may be sold commercially, although credit to Megmade with Love would be appreciated!